Severtson Screens (www.severtsonscreens.com), a global leader in innovative and quality projection screens for the pro AV, commercial, home theater, and cinema markets, is now proud to be four for four. Inventure Studios, located in the increasingly popular and rapidly developing North Hollywood district of Los Angeles, has just completed another renovation updating its audio and picture capabilities to better support its post-production clients. With the upgrade to Studio C comes the installation of a 100-inch (diagonal) 16:9 Severtson IF169100 Impression Series projection screen, now making all four of its studios equipped with a Severtson woven SAT-4K acoustically-transparent screen. Inventure also utilizes 135-inch, 150-inch, and 200-inch (diagonal) Severtson screens in its other three studios. Inventure Studios is a leading, independent provider of post-production services for film, television, video, and web content, delivering high quality media for demanding schedules. 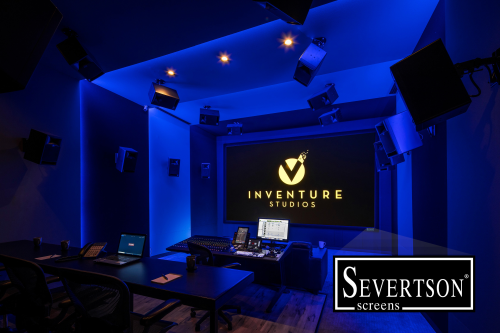 Inventure Studios features four stages that provide a wide range of audio solutions, including Audio Deliverables QC, ADR, and a Dolby Atmos Certified mixing stage. In business for more than five years, major studio clients include Lionsgate, Universal, Paramount, Fox, Disney, and Warner Bros.
Severtson’s SAT-4K (Stellar Acoustically-Transparent) is a revolutionary new woven material designed so that the entire sound stage can be placed directly behind the screen at the same horizontal axis, allowing the audio track to be in perfect sync with the brilliant images on display. The SAT-4K screen meets or exceeds all industry standards for optimum video and acoustic performance, with reference quality reproduction of the digital image combined with true fidelity to the soundtrack. SAT-4K material has virtually no size limitations…it can now be used on small screens and exceptionally large screens. The SAT-4K comes in heights ranging from 37-inches in Impression Series, to a massive 15-feet 10-inch Pro-Frame or cinema screen.